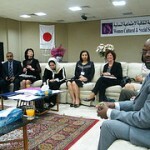 Yesterday marked another full day of meetings with government and social organizations in Kuwait. We started by meeting with the head of the Chamber of Commerce in Kuwait, a nonprofit organization that represents business industries. The president of the organization discussed his desire for a larger private sector in Kuwait. At the moment 96% of Kuwaiti’s are employed by the Kuwaiti government – which provides a job for all Kuwaiti citizens who wish to work. His concern was with diversifying the income and industry in Kuwait away from the oil profits they have benefited from in the past. 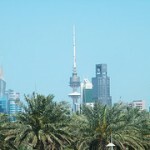 The growth of privatized companies would provide greater security and opportunities for Kuwait moving into the future. We followed up the meeting at the Chamber of Commerce with meetings with executives at Kuwait Petroleum Company, a state owned industry that provides the wealth for this small Gulf nation. The discussion centered around energy consumption in Kuwait and the role of Kuwait’s oil worldwide. Reverend Stanley Watkins (Chief of Staff to Congressman Bobby Rush) discussed US energy policy (Mr. Rush is the Ranking Democrat on the Subcommittee on Energy and Power of the U. S. House Committee on Energy and Commerce) and the role of alternative energy sources and reducing oil consumption around the world. 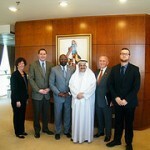 For the afternoon we had the honor of being guests at the Embassy of the United States in Kuwait. We were hosted by Ambassador Deborah K. Jones who showed her keen diplomacy skills in leading a discussion about Middle East politics and the role of Kuwait in the Gulf. We also gained her insights from living in the Middle East and being an expert on Middle Eastern Politics for many years. I was struck by the levels of skill, intelligence and diplomacy that she displayed and her extreme capability to serve in this role during a turbulent time. We also spent some time exploring role of civil servants and government workers – striking the balance between youth and energy with wisdom and knowledge. A strengthened professional civil service workforce can supply stability and security in government operations that support citizens in their nation. Finally, we had the joy of meeting with The Women’s Cultural & Social Society, the first women’s society to be established in Kuwait. Since 1963 the Society’s objectives are to develop women in all fields, encourage their participation in community activities and increase awareness of women’s rights in the region. This nonprofit organization leads a variety of programming from youth development initiatives to leading the political action for women’s right to vote which was granted in 2005. There are currently 4 women in Parliament and 1 female minister in the cabinet. Earlier in the week we had met with Dr. Aseel Al-Awadhi – one of the first female Parliament members. Today Mary Helmig (Legacy International) and I head to Oman to continue the program with a new set of delegates from the United States, while the other US delegates head back to the states. Learning about the political and cultural life in Kuwait has been interesting and exciting… I’m looking forward to the opportunity to be able to compare my experiences here with those in Oman.